At Rentguard we are dedicated to working hand in hand with our clients and support their brand while building their business. We are prepared to work hard in order to nurture the relationships with our partners and help them fight to win and retain business. These pages were put together with our clients in mind and aim to support their marketing, promotional and customer referral requirements. We are open to suggestions so please let us know your thoughts and views on any potential improvements by filling in the suggestions form or by emailing us at info@rentguard.co.uk. Use this product training guide as a sales aid which will assist you in outlining the entire Rentguard product range. Rentguard is here to help you if the unexpected happens. Sadly, there are some things that even we can’t prevent. View and download information factsheets to help you secure yourself, your property and your possessions against risks. NOTE: PDF files can be quite large, and may take a long time to download over a slow Internet connection. Rentguards website is the easiest and quickest way to get all supporting information to help you and your business. Our Online Quotation System allows you or your customers to get a quick quotation online for all insurance products you agreed to trade on behalf of Rentguard. This system is converted into a link, which allows you to place it on to your website. This vibrant system is implemented with a transaction section that allows your customers to proceed and purchase their desired insurance online at the agreed insurance premium. This system is absolutely free and gives you a helping hand in handling your customers’ insurance policies. The unique identification tracking number given to all registered agents who sign up to use our online quotation system allows us to track online agents’ performance and keep your commission levels accurate. Our Online Quotation System can be co-branded or white- labelled to suit your own brand identity. All you need is to provide us with your company logo and any associated guidelines and we will manage the set up for you. What is Online Quotation System? Online Quotation System is an online insurance trading platform – it’s simple, quick and accessible through either Rentguard website or agent’s branded link. Did you know that Online Quotation System…? We are currently working on an online registration facility. In the meantime however please contact your dedicated Account Manager on 0208 587 1060 who will be able to take you through the straight-forward registration process and supply you with the password required to log in. To retrieve your login details such as agent number and/or password as well as for all technical queries and support please contact your assigned Account Manager on 0208 587 1060 or fill in an online enquiry form. We have designed a range of promotional material to help you to let the potential customers know about your partnership with Rentguard. 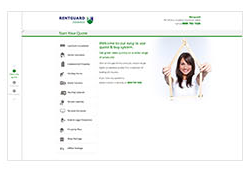 Here you will find everything you need from Rentguard in order to support your business. You can also order hard copies of the above promotional resources and we will put them in the post for you. To order simply contact your dedicated Account Manager on 0208 587 1060 or email, specifying the preferred amount of required items.